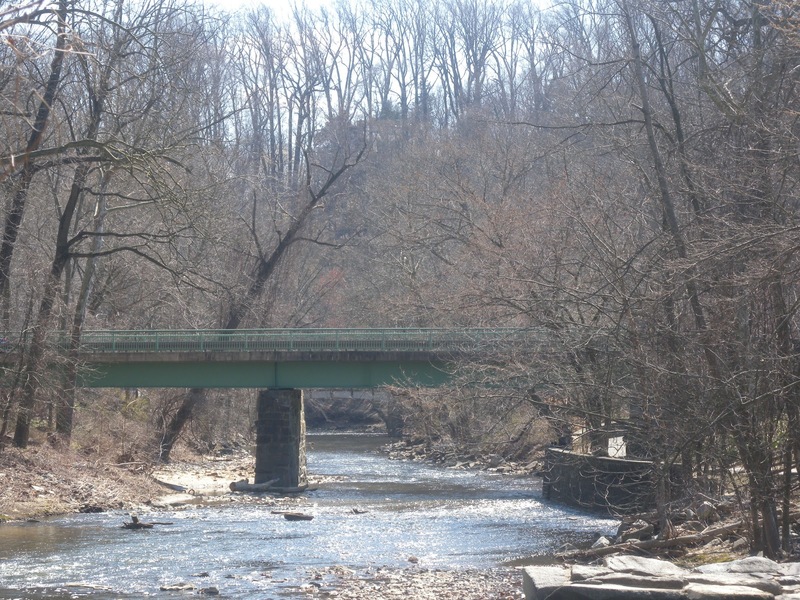 The location was Rock Creek Park at Pierce Mill. 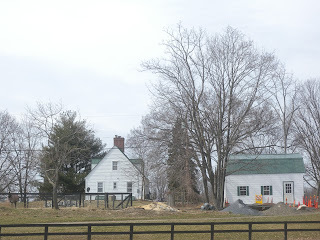 That is the mill on the right side of the photo. 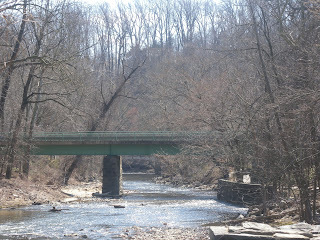 Rock Creek Park winds its way for miles through Washington DC following the path of the creek it is named for. Looking at this scene it is hard to imagine that bustling Connecticut Avenue is a mere two minutes away or that just beyond the park are a number of large embassies. This is one of the reasons I love this city. No skyscrapers and lots and lots of green space. 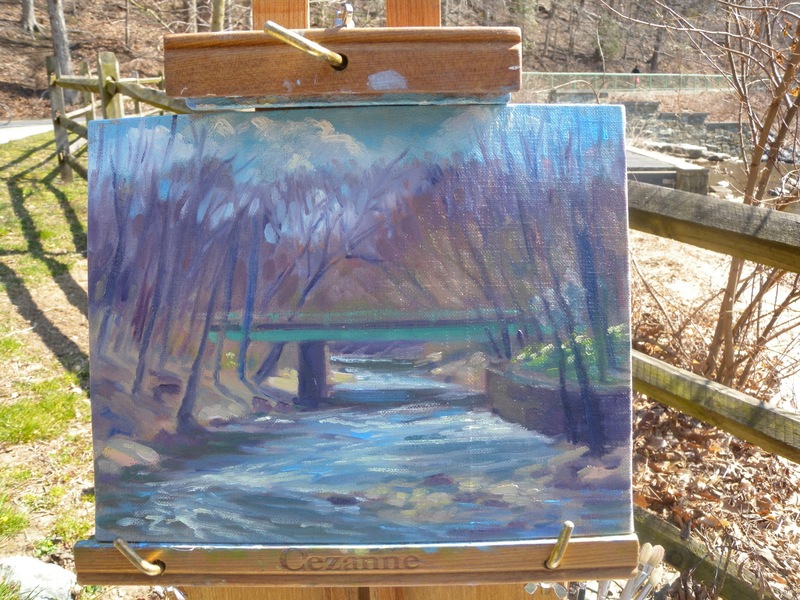 I arrived around 12:30 and sat and sketched for awhile until I decided on the view beyond the small falls. I liked the moving water and the green bridge. Lots of light and shadow. At 3:30 we stopped painting and gathered beyond the mill to see everyone's paintings and have a critique. That is traditional with this group. They are kind. They give good advice. Yesterday I started work on this new painting. 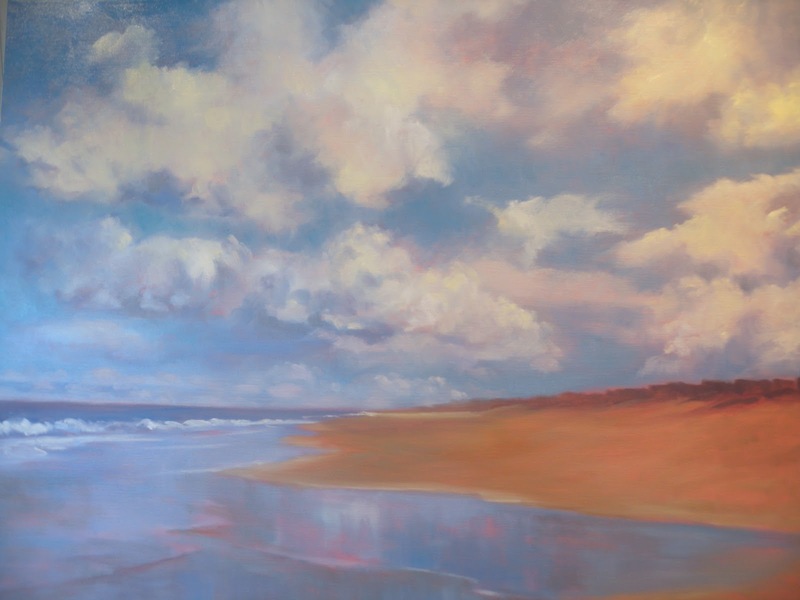 My mind has been wandering back to the Outer Banks of North Carolina and this scene was inspired by a day of magnificent clouds. I felt tiny. I felt very aware of being on a small spit of land surrounded by vast sky and ocean. That is the feeling I am going for in this painting. I am considering adding gulls in the pools of water in the foreground and/or small figures on the beach. However, I may just go with land, sea and sky. I didn't take this photo until I turned the lights on which is why the clouds on the right seem so much more yellow. They were close to the lights. I didn't have time to do a very good job photographing it I just wanted to document the progress. I am eager to get back to work on the painting and I am very much enjoying working in a larger format again. This is the first 30x40 painting I have done in a very long time and this used to be one of the most common sizes for one of my paintings. This one is on a 1 1/2 inch deep gallery wrap canvas and I don't plan on framing for now. Tomorrow it is doubtful that I will be working on this as I plan to be out painting with the Washington Society of Landscape Painters. We will be painting at the Pierce Mill in Rock Creek Park in DC. Thank goodness the weather forcast is for sun and just 9 to 10 mile per hour winds. It has really been blowing this week and I hate having to batten everything down! 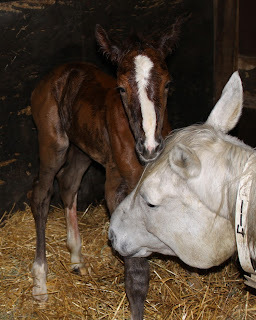 Speaking of new beginnings.....I just have to share this photo of a beautiful newborn filly foaled at Cornell University. She is Ellie's (Urielle's) new baby and this photo was taken just after she stood up for the first time. 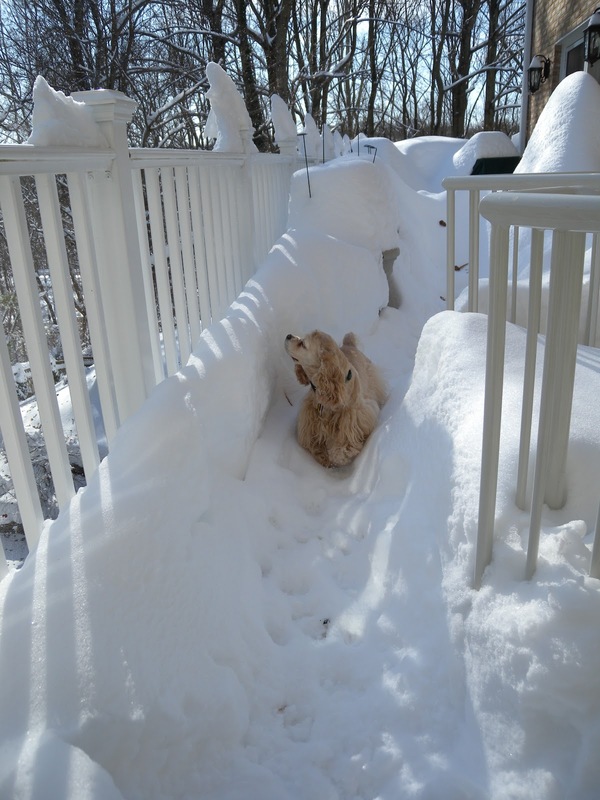 Ellie is still cleaning her off. Urielle is a mare who used to be mine. 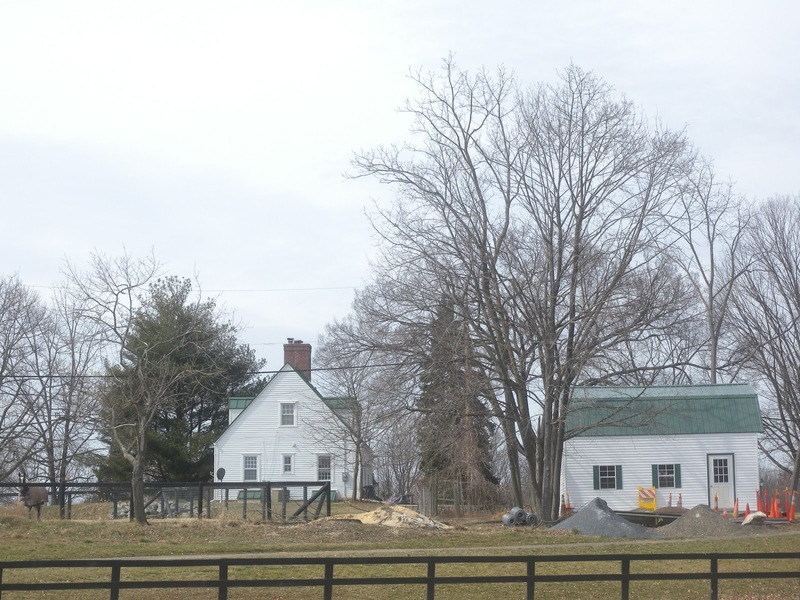 She is now part of the Cornell University breeding program and has been since 2003. She has produced some truly wonderful foals who will be making their contributions to the dressage and eventing worlds. This filly, like all but one of Ellies offspring was sired by a magnificent Hanovarian stallion named Benvolio. The exciting news this year is that Ellie was actually pregnant with twins and instead of pinching off one of the embryos Ellie carried one and the other was implanted in a surrogate mare. So, on April 10th we are expecting a sibling to this baby! Carol Collyer of Cornell has been a wonderful friend and has kept me informed of all Ellie's offspring. I am partial to mares and Ellie will always be one of "my girls". 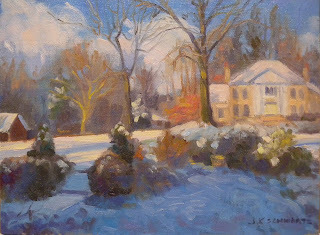 A Snowy Day and a Newly Finished Painting! It was something of a surprise to wake up to heavy snow this morning. It was really pretty early in the morning but by afternoon it was being washed away by rain. 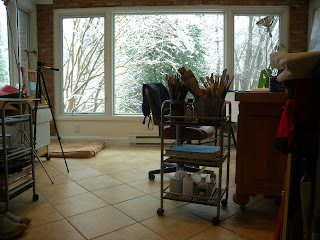 Still, it gave me an excuse to stay home and enjoy a full day in the studio. I finished "Leaving the Inlet" and the completed painting is shown here on the left. If you scroll down to the March 2nd post you can see the sketches for this painting and then watch the painting progress in subsequent posts. The more I work on gessoboard the more I like it. I experiment with different ways to prepare the surface. Usually I like to leave heavy brushstrokes in the gesso as I like the way the paint fills the grooves and creates a texture. This time instead of applying the gesso with a brush I used a foam rubber brayer. The surface it created had more tooth than if I just worked on the factory prepared gesso surface but it was more uniform than that I customarily work on. This is the third Lake Cayuga painting I have done and I suspect I will do at least one more. Next up, however, is a large beach painting. Be sure to check back to watch that one develop. Second Day of Painting "Leaving the Inlet"
Busy, busy, busy was the weekend! I had planned on working on this painting but instead I got caught up with framing and varnishing and updating my bio. I also put together some of those 6x8 panels I posted about last time. I do miss the convenience of my ready to paint old ones. Such is life. Maybe someday I will be successful enough to have an assistant to take care of such things. I can dream can't I? Back to the current painting.....Today I worked a little bit on the sky but spent most of my time on the lower portion of the painting. I am very glad I chose the alizarin crimson underpainting as it has been just right for this early morning light. 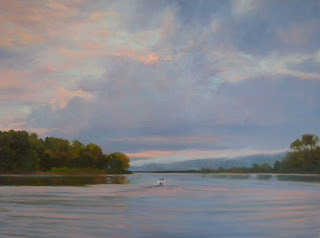 The little speck of white in the middle of the painting is where I will be locating the launch that is heading down the inlet to Lake Cayuga proper. My husband and I were in a launch following this one which is how I was able to see this view. I love painting skies and water! I don't want to overwork this sky so I will leave it for now and probably add a few brushstrokes at the end. The sky is always the fun part for me and I have to be careful not to spend too much time there and not enough on the rest of the painting. The nice thing about painting skies reflected in water is that it is logical to work on the two elements at the same time and I therefore work around the painting rather than in segments. I haven't added the link to my website in quite some time because, as usual, I am behind on updating it. Actually my next update is going to be the reorganization of it and I have been working on that on paper. Again, I sure wish I had an assistant! First Strokes, "Leaving the Inlet"
I showed you the sketches for this painting in my last post and today I got off to a good start. I am happy that I chose the underpainting of alizarin crimson as I think it will serve me well. This is an early morning scene and the colors in the sky reminded me of the colors I see in the shells I find on the beach at the Outer Banks. This, however, is not the OBX but, as I have already written, is Lake Cuyaga in Ithaca New York. The lake is one of a group of glacial lakes which make up the Fingerlakes in upstate New York. The region is very beautiful and I love our visits here! I hope I will have more progress to show you tomorrow. 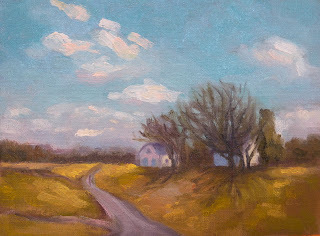 Also painted today is another addition to my Farmhouse series. This one was painted uber fast because I only had a very short time left. I will have to add a few strokes tomorrow to finish. The drive needs more work and I need to indicate a window on the house. I know I have mentioned how much I enjoy these and I do hope you will not become bored by them. This may just turn out to be folly on my part as I have no idea where and when I can exhibit them all. I also need to consider the framing issue and have asked for some advice from my frame supplier. I would hate to wait until I have a huge amount of them before starting to frame. I also need to be sure that whatever frame I start with will still be available at the end of the year. That last remark is important as I have recently found out. These little paintings have been painted on clear primed linen panels that I have been using for years. 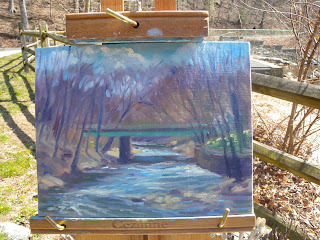 They are one of my favorites for plein air painting. When I got down to just one 6x8 left I contacted my supplier to order a dozen more. Unfortunately they will no longer be carrying this size. I can still get them in larger sizes, which is good news, but won't be any good for this series. So...I got online and searched for other distributers of these panels. I found a number of them but guess what...they are out of them as well. They have been discontinued:( Now, there are plenty of 6x8 panels to be had out there but not with the same texture and not clear primed. Believe me, I have looked! So, either I can use another brand and underpaint with umber (a wash of that will mimic the color of the clear primed linen) or get creative. I chose to do the latter. It's finished. Well, except for one tiny thing I noticed as I uploaded this image. I forgot to paint one of the supports for the pavilion. The one on the right is missing, although you can hardly tell. I am pleased enough with the painting that I have ordered a frame for it and will enter it in some shows this spring/summer. I know this place so well and it is winter evenings like this that have kept my husband and I returning over and over for the last twenty plus years. It can get a little crazy in the summer but in the off season it is meditative. At this point on the Outer Banks the Atlantic Ocean is separated from Currituck Sound by a scant quarter of a mile of land. Our house is located on that narrow spit. Yes, it is brinksmanship. It is also a little piece of heaven. Being surrounded by those two magnificent bodies of water and the vast sky putting on one light show after another it is easy to forget the stress and turmoil of life. 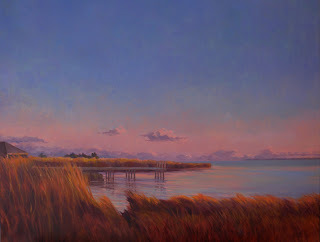 You will be seeing more Outer Banks paintings coming from me this spring! Coming up next, however, is another painting of Lake Cayuga in Ithaca New York. I have primed an 18x24 inch gessoboard panel and toned it with a wash of alizarin crimson. Below is the small sketch and color study I will be using for the painting. This painting is inspired by the same day depicted in "Above Cayuga's Waters". 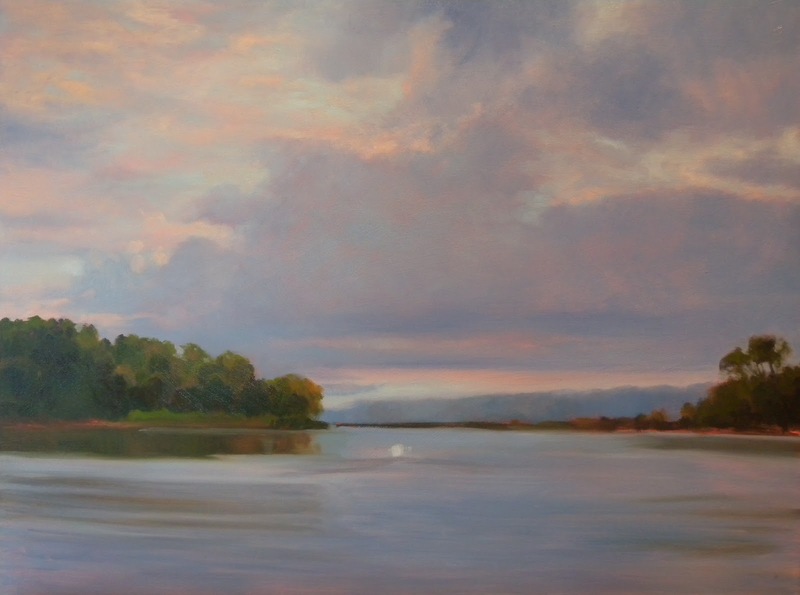 We were out on a launch at dawn heading from the inlet to the lake and the first painting was based on a photograph taken just as dawn was breaking. 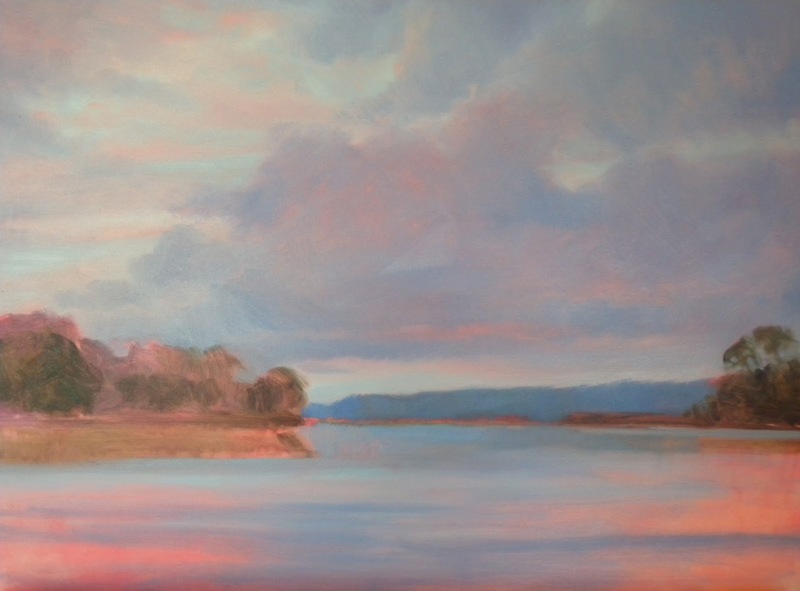 The painting I will start tomorrow is based on a photograph I took just as we were about to leave the inlet and the sky had brightened considerably. There are times when there is no other option but to work from photos and I enjoy doing that. I do however find that it is best to first do a drawing and a color study to create a couple of degrees of separation from the photo. I can edit things, add things, manipulate the image to suit my needs and I can almost guarantee that I will make more changes once I start to paint. I am so glad I put this painting in the closet for a few days. It wasn't working but there was enough worth saving that I didn't want to give up on it. It always helps to see with fresh eyes. I knew it was the sky that was bothering me and when I took the painting out of the closet the first thought I had was, Bleh! The sky is terrible BUT it sure has potential as an underpainting. I have shown you this painting in stages from the original underpainting to the point at which I put it in the closet. You can scroll down to see the various incarnations. What I like at this point is that the surface of the painting is now consistent and rich. The color is much improved and I have reached the fun point where I am finishing the foreground and doing some overall fine tuning. 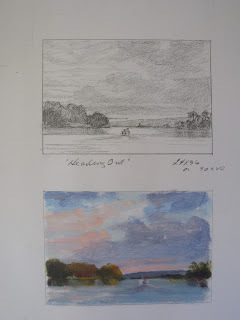 I am toying with the idea of putting a cloud formation more in the foreground but I will work out that idea with pastels on a photo print out. So, this painting really had two underpaintings and two starts. The original, ochre, burnt sienna underpainting which I painted over wet on wet. Then off to the closet and the dry painting with the first sky was painted over leaving some of the blue/green and yellow/orange showing through which gives the sky more depth. 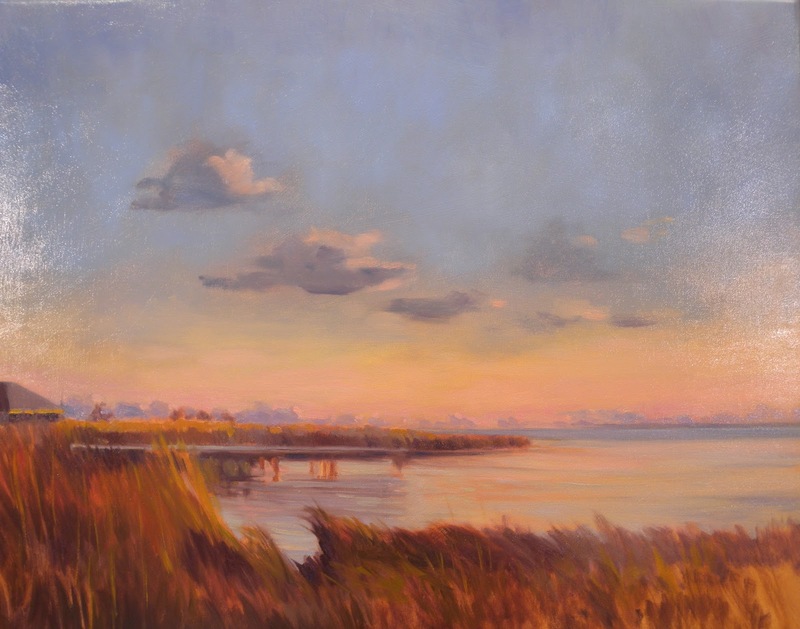 The original, stronger colors of the sky were softened and the surface enriched. Now I feel I have something. There is no title as yet but I am working on it. The last two days have been relatively mild but you would never know it thanks to the gusty, 30/40 mile per hour winds. It is fair to say that March is coming in like a lion. That's OK if the lion keeps producing light shows like this! The clouds were racing across the sky and the light was intense producing radiant edges to the clouds against the clear blue of the sky. Add to that some remaining snow and I had a great moment to preserve in paint! I keep mentioning how much fun these paintings are and this one was a particularly good time. I spent most of the day painting and I worked on the Currituck Sound painting I posted about yesterday. The lower portion of the painting is working well but I have become unhappy with the sky. I am considering making a major change. When I get like this I have found it wise to banish the painting for a short time and reconsider so it is off to the closet for a couple of days. If, when I take it out I feel the same way there will be a major change on the way. I am not exactly sure what I will do but I will follow my instinct. This is the painting I started last weekend and you can see the first stages of it from my blog post on Sunday. Maybe it was Saturday? Time just flies.... I talked about the start up and working wet into wet. Then I let the painting dry so that I could work thin layers of wet paint back over the underpaintings and that is what I did today. If you compare this to the first stages you will see that I painted out the clouds I had roughed in. I did so because I did not like where they were located, nor did I like the forms. I let the little snippet of one of them remain because I think I will use it. I worked all afternoon and stopped when it started to get dark out. 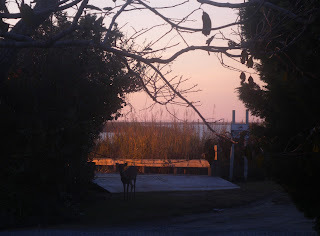 I had just begun work on the dock. The painting still requires a good deal of work but the main decisions have been made. I do need to sketch out some clouds to see what will work best here. What I like to do in a situation like this is to print out the photo of the painting as it is and then use pastels to sketch in clouds. I can print several copies and try different things. Hooray for technology! This photo almost has the colors right but not quite. I find this light effect very difficult to photograph. Also the photo makes it appear that there is a ripple in the canvas. That does not exist, it is simply glare from the surface. I do not have a title for this yet. 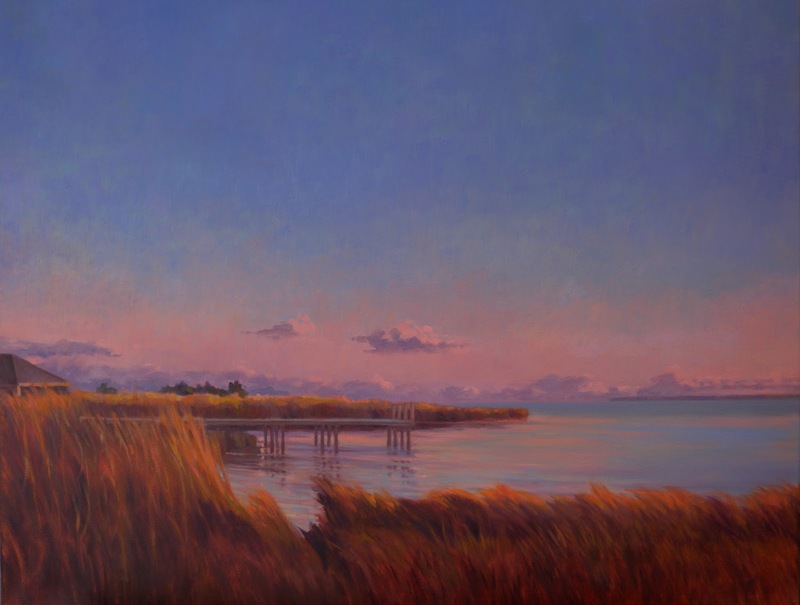 I have done so many Currituck Sound paintings that I have used up many titles that come to mind. This was an evening week before last so maybe February should figure in the title. I'll think about it as I work. This little guy was standing at the entrance to the dock when I went out to take photos. He wasn't very skittish. Today Mother Nature offered up a "polite" snow storm, at least for the metro DC area. I say polite because the warm weather yesterday heated the roads enough that the snow melted quickly making driving easy. More important we didn't lose power! The latter is always a concern for us as it doesn't take much to knock it out around here. I love our beautiful, mature trees but I don't love that the power wires are threaded through the branches! 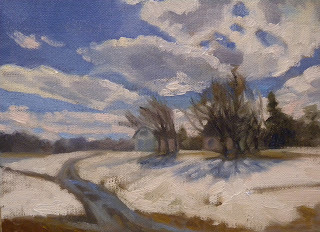 I spent the morning at the barn and then came home to paint another mini for my series "The Farmhouse". It was windy and heavy snow was falling making us think that perhaps this was going to be as serious an event as advertised. I was just delighted to have another opportunity to paint a snowy day! 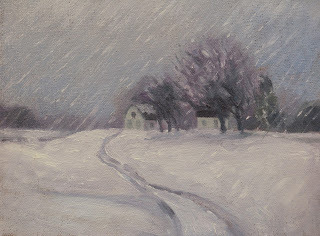 I approached it as a study in grays and this is the first time I depicted the falling snow. It is great fun painting snow and it almost makes me wish for more before winter ends. Almost. 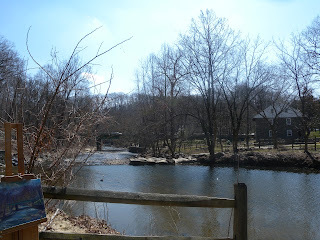 Actually I am looking forward to spring and I hope this weekend we get the warm, sunny weather that is being forcast so I can get out and paint. Three artist friends and I had a wonderful plan to drop off our entries at the Art League today for the monthly juried show and then jump in Lisa's van and head into DC to visit the American Art Museum, have lunch and get back to the Art League in time to hang the show. We have all been members of the "Hanging Committee" for years and enjoy spending time together. Add to the experience that the pre snow weather today was warm and sunny and you can get the picture of a rather idyllic day. Sadly it did not work out that way for me. I have three elderly dogs and an elderly horse. Instead of meeting my friends I ended up following up on my equine vet's instructions for Gypsy who has a bum leg and a cold and then had to make an emergency trip to the vet with one of my cocker spaniels, Twinkle. That took the rest of the afternoon. I love them dearly so I would not have considered doing otherwise. I did, however, make it in time to hang the show which is a beauty this month. I wish I had had a crack at entering. I was happy to see that my friends had their work accepted and Tom even got an honorable mention! Good job guys! 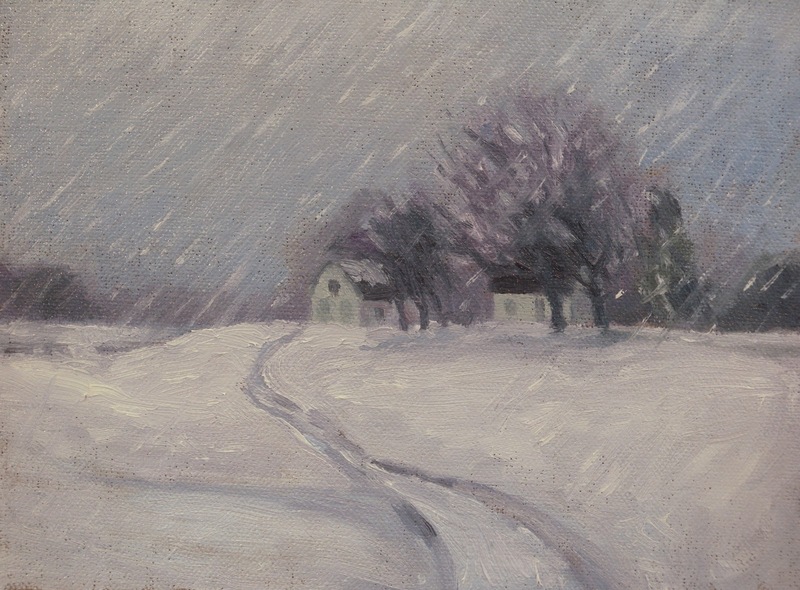 ON EXHIBIT IN THE ART LEAGUE BIN GALLERY is the above painting, "First Snow". Considering we are about to get a major dumping of the white stuff I think it appropriate. The Bin Gallery, for those of you who are not familiar with it, is the room at the gallery where those of us who have been juried in to at least three shows each calendar year are allowed to exhibit each month unjuried. We can hang one work on the walls and keep five in the bins. Happily I have already made the three show quota for this year so I am good for yet another year in this space. Sales are generally good in the Bin Gallery so I am loathe to loose the privilege. On Friday I started a new painting inspired by our trip to the Outer Banks of North Carolina last week. 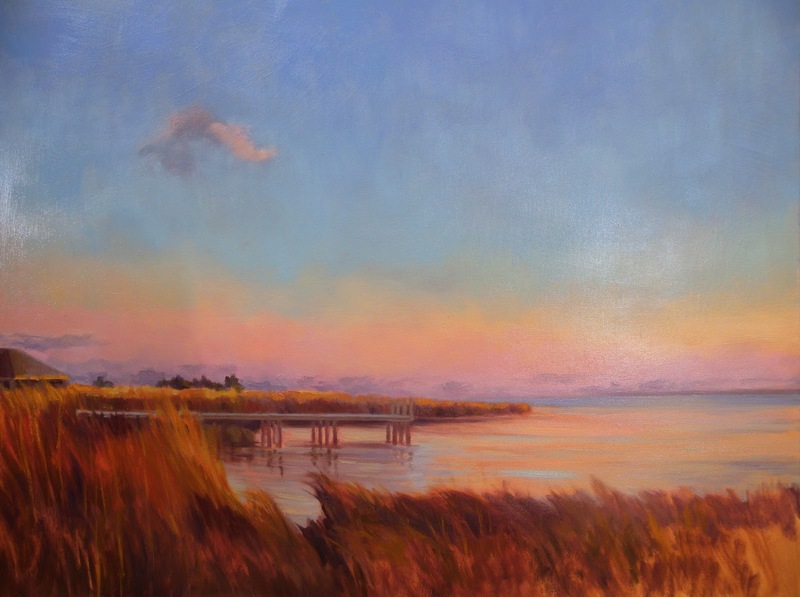 We spend a lot of time there and both the Atlantic Ocean and Currituck Sound provide many beautiful scenes to paint. 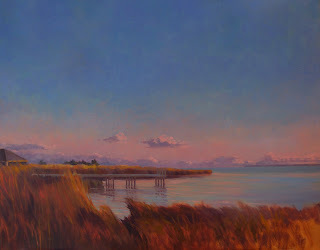 This painting is the view looking south on the Sound from the dock across the street from our house. 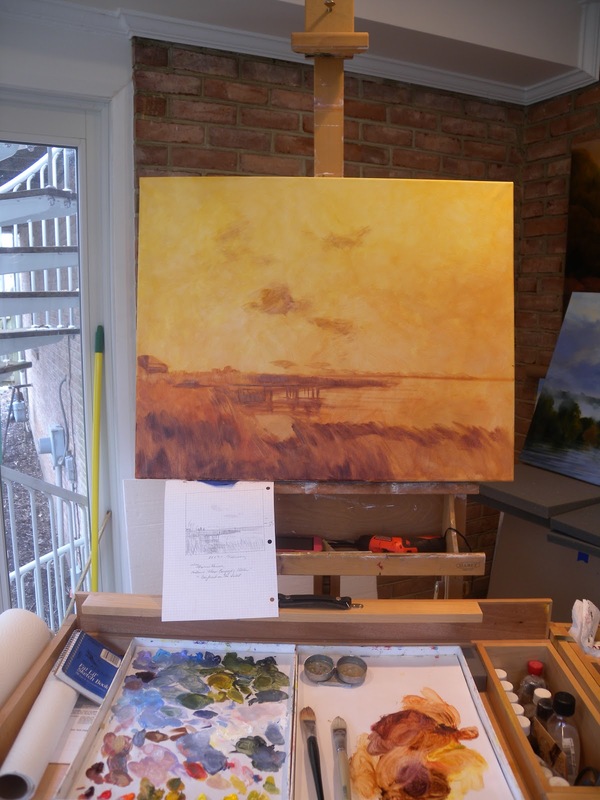 I started with an underpainting of yellow ochre, burnt sienna and burnt umber using those colors to grade from lighter to darker from the top of the painting down. I then did a rough sketech in sienna and umber and called it a day. Saturday I began laying in some color and used the technique of putting the color down and taking some off to let the underpainting show through. Then I lay on a slightly different color and repeat the process. I continued doing that today until I had the canvas well covered with paint and had sheer layers of color. Late in the afternoon I began working on bringing the grass forms to life and working with more opaque applications of paint. I stopped when it started to get dark because with sheer layers like this the light really affects the color. The image below is where I left off today. Now I want to let the paint in the sky area dry so I can do some glazing with wet paint on dry. However, I will continue to work wet on wet in the lower part of the painting. I hope you enjoy it!